The photo above is from the dock at the crab house on Gwynns Island. They don't wear crab hats at the crab house, but they really ought to consider it. Crab house workers spend many dark hours indoors picking crab meat under black lights that help illuminate every shred of meat in the shells. It's really quite the operation,and I never would have known this if not for a tour arranged by Chesapeake Bay Father a few years ago. He hauls seafood (part-time) for the owner of this place and drives a truck to Jessup, Maryland, some nights, or Landover other nights. Rising at 2:00 a.m., he heads to Deltaville where he picks up his seafood-laden truck which he then steers to distributors up north. There he waits for his truck to be unloaded before he drives the several hours back home, sometimes not arriving until noon the following day. That's not an easy way to make a living when you're almost 70 years old. Picking crab meat is not an easy way to make a living either. It's tedious work, but I'll bet a few good crab hats would brighten their days. Note to self: A tour of the crab house would be a great Blog Fest activity. Third note to self: Self, leave me alone. I'm tired, and there's too much going on. Fourth and final note to self: Get with the program and focus on Blog Fest. And don't laugh at my use of the term "focus." Now get to gettin'. Above is a westward looking shot from the Islander, a Gwynns Island motel, restaurant and marina that used to be a wonderland. Those posts made up part of the marina until Hurricane Isabel decided she'd had just about enough of it. The Islander is one of those places about which a book or a movie could be written, so much happened there. There are lots of places here in the county that have a story to tell, but unless someone tells the tale, the buildings will die and their stories along with them. You probably don't realize this, but that was just a round about way of saying that life as I know it will soon be changing because I've signed a contract to do a book. It has taken me several months weeks to be able to put those words down, but there, I said it. I've signed my life away. Officially and completely. Once upon a time, Chesapeake Bay Woman tried to blog as a way of keeping her mind off one of the most horrendous times in her life. Blogging very successfully distracted her from real life, and she discovered that she liked her imaginary life in cyberworld taking pictures as well, even if she didn't know what a digital camera was how to use her digital camera. Then one day, a publisher who stumbled upon her blog contacted her and asked if she'd be interested in doing a book on Mathews County. CBW jumped up and down for joy and spewed off all sorts of ideas for the book she wanted to write. The publisher was amused by encouraged by CBW's enthusiasm and sent her the paperwork for a proposal. What CBW didn't realize at the time was the publisher had very strict specifications for the book, which is to be a pictorial history of Mathews County. There will be pairs of photographs: "Then" photos (which CBW must acquire and research) will be paired with "Now" photos, which CBW will take herself. Then 600 30-60 words explaining the historical significance of the photo pair must be provided. Several hundred photos are needed, plus several thousand hours to research each one, and already CBW requires smelling salts just to finish typing this sentence because the amount of time this project will require is overwhelming. Please listen to the Kenny G. elevator music while CBW revives herself. There now. Where were we? Ah yes, any spare time I didn't have before will soon be even scarcer. Did CBW mention that she already has a day job with a 100+ mile round trip commute? Did she mention she has school-aged children with very busy schedules? Did she mention she has a house and yard to maintain, a house loaded with insects and faulty electrical outlets? Did she mention that history isn't her thing and the prospect of having to do anything under any sort of a deadline causes her to contemplate a swan dive off the New Point Lighthouse? CBW was overwhelmed by the proposal and soon convinced herself there was no way she had the time or resources to devote to such an enormous (and important) project. However, she realized this was not an opportunity that came knocking every day, so she told herself she'd try to do the proposal to the best of her ability, even though she was in the middle of kids, school, spring sports, spring concerts, overdue bills, family emergencies, other emergencies, and a panic attack. She felt certain the proposal would not be accepted because she did not have the time or ability to focus on it at all! properly. So she completed the proposal and sent it off, happy that she at least tried but confident that nothing would come of it. Then, just before Memorial Day, she received an e-mail which said, "Mathews County Then and Now: Proposal Accepted!" Then she fainted and hit her head so hard she hasn't been right since and has taken to wearing crab hats at island festivals. p.s. I need the community's help in a big way. 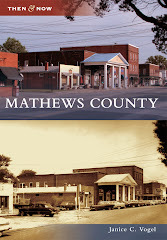 Anyone with any ties to Mathews: I need your old postcards, your old photos, old newspaper clippings - any old photographs of Mathews County sites such as schools, wharves, churches, the court house, the lighthouse, beaches, country stores, post offices, houses, plantations/estates - anything that would represent Mathews. If I use your photo--and I will-- you will be credited in the book. I will then take a current-day photo of the exact same place to place beside it. Once upon a time there was a festival in a charming little place called Gwynns Island. One day just prior to the festival, Chesapeake Bay Woman went to Dollar General down in the court house. Before she could get through the doors she was engaged in a conversation with Cricket, who organizes the festival. CBW asked if there was anything she could do to help Cricket, and before CBW forgot what she came to Dollar General for, she was leaving with 5 books of raffle tickets to be sold at Saturday's festival. The part of this post having to do with Dollar General is now over. We now join the Gwynns Island Festival portion, already in progress. Given all this, she decided the only way to get through a festival involving ticket sales was vodka shots to call on the good ole, reliable crab hat. CBW discovered the crab hat on a camping trip on the Eastern Shore several years ago, and she immediately fell in love. The hat is not too hot, not at all cool, and plenty crazy, which pretty much sums up CBW's life nicely and neatly. Much to her surprise, festival attendees were enthralled with the crab hat. In fact, if CBW had a nickel for everyone who asked where she acquired the crab hat, CBW might be able to quit her day job. In fact, CBW is seriously contemplating quitting her day job ordering mass quantities of these crab hats to sell at Mathews Market Days and next year's Gwynns Island Festival, but don't hold your breath because CBW rarely follows through with anything and most assuredly cannot quit her day job. Anyway, as people stopped to inquire about the silly hat, CBW explained where it came from and then ever-so-subtly mentioned that she was selling $1.00 chances to win a whole lot of money. Nine times out of ten, the person asked if this was gambling purchased a ticket, and I would like to thank those nine who did because the proceeds benefit the Gwynns Island Civic League. But perhaps best of all, CBW met two new friends as a result of the crab hat. One of them is pictured above, and the other was taking the picture. They are the sort of people you want to hang around with, because they smile a lot and they exude warmth and happiness. Plus, they liked the crab hat, which makes them extra special. All this means one thing: They must come to Blog Fest. Thank you for spending time with me on Saturday, and thanks for sharing your photos since I, who claim to be a photographer, forgot my camera at home. Please stop by my house on Thursday, July 15, for a cookout to kick off the 2010 Blog Fest. I guarantee you'll have a good time whether you're wearing a crab hat or not, although everything in life is more fun with a crab hat. Here we have another beautiful Queens Creek sunrise. Well, it's Sunday once again. Ordinarily, I'd be approaching this day with dread and apprehension. Not that I have anything against Sundays, it's just that they precede Monday, which is the worst day of the week, followed by Tuesday and then every other day except Saturday Wednesday. But today I welcome Sunday with open arms and a great big smile because I have tomorrow off! Now, that does not mean that I will be relaxing, no, of course not. There's grass to cut and beds to weed, but at least I won't have to drive in to work. Hello, Sunday, come on in and make yourself comfortable. May I bring you a cold drink and a cheese plate? Here, sit down and relax. It's been a while, we have a lot of catching up to do. Hope you enjoy your day to the fullest. I know I intend to. This exquisite old building is between Cardinal and Bohannon--which is sixteen miles east of Neptune, and only a few miles south of Uranus, give or take. The whole Cardinal/Bohannon/Mobjack area is a part of the county that may as well be on another planet I never visit unless it's to pick up Chesapeake Bay Daughter from her friend's house on the East River. This is a shame, because some beautiful old buildings live over there. I'm long overdue to spend some time over there taking photos, but that will have to wait, because today is the Gwynns Island Festival, and I must don a crab hat and sell 50-50 raffle tickets. You know, what everybody does on a Saturday. So if you're in the area today, head on over to the island for some good food and music, and if you see a lady wearing a red crab hat, alert the nearest law enforcement officer be sure to buy a ticket. The photo above was taken from Gwynns Island on the last night of Blog Fest 2009. With everything that's been going on around here lately (namely, the community's tremendous loss of a beloved resident), there hasn't been any time to formally contemplate communicate the game plan, and only a small part of that is due to the fact that the game plan has not been solidified. But never fear, CBW works best under pressure, which is a good thing because she's no stranger to pressure. In fact they are conjoined twins BFFs. Free time to wander around the court house, which is the "downtown" part of Mathews. Cookout on the beach at Gwynns Island-Chesapeake Bay Baby Sis will make an appearance. b) Whether you plan to stay all 3 nights or just a part of the time. (Of course having an agenda would be helpful to answer this question. I promise by next week I'll have something out. c) Whether you require lodging. We have space here at my house, plus a reader has very generously offered her home if we need it. Commercial lodging is limited, as in there are no hotels/motels but there are lots of private cottages that can be rented out - with enough notice. d)If you are interested in a souvenir Tervis Tumbler. Big Hair Envy is placing orders. Remember that free lodging is available at my house and from a very generous local homeowner, so the sooner your respond the better. In my next communication on this topic, I'll include an estimate of out-of-pocket expenses (minus transportation to get here, which of course varies), but last year it was minimal. There were a couple of meals out, souvenirs, a nominal fee for the boat ride, whatever you want to buy in the form of beverages, and that's about it. Big Hair Envy and I can't wait to see you all, and thanks for being patient with the details. Welcome to Three Thing Thursday, where I share three things and you share three things on any topic whatsoever, assuming it's rated PG-13; PG-23 if you're Mathews Mark. 1. Although it looks like every other another photo I posted recently, the sunrise above happened yesterday. Stumbling around cussing looking for something clean to wear to work, I glanced out the window. These scenes change very quickly, so I dropped what I was doing (namely, dressing), ran to the kitchen to wrench the camera from its case, and darted onto the back deck to snap away. Thankfully, the man who fishes crab pots right off my shoreline had not made his way around yet. Otherwise he'd probably be writing a blog post somewhere about the crazy lady standing on her deck wearing not much more than a camera. 2. I'm trying to get a headcount for Blog Fest, that little Mathews County shin dig we're throwing here in a few short weeks, three to be exact. If you'd like to attend and haven't already done so, please e-mail me at ChesapeakeBayWoman@gmail.com. Details are forthcoming, as soon as I make them up I promise. In the meantime, if anyone knows where I can borrow or rent a landscaper, a maid and a chef a margarita machine and a karaoke machine let me know. 3. The Gwynns Island Festival is Saturday. Anyone interested in purchasing 50-50 raffle tickets should look for the frizzy-haired, middle-aged, yellow-ticket-holding woman wearing a crazy crab hat. She no doubt will be flustered because she can't talk and chew gum sell tickets at the same time, which also means that anyone who hands her more than exact change can expect to receive inexact change. Tickets are one dollar apiece. The winner splits the proceeds with the Gwynns Island Civic League; last year's winner took home over $700.00. Not a bad deal for a dollar. Now it's your turn to share three things, whatever you want. Anything at all. This is my mother's garden, and I've never seen anything like it. You name it, she's growing it, and not just growing it--Miracle Growing super-sizing it. Above is a sample row of squash. She has another row that is almost sky waist high. Have you ever seen chest waist-high squash plants? I hadn't either. Her thumb isn't just green, it's emerald. In addition to squash (yellow and white), she has beets, cucumbers, green beans, strawberries, herbs, zucchini, eggplant, tomatoes, peppers, onions, okra, lettuce, a blueberry bush, a birdbath, a sideways bird feeder, a killer goose, two lame ducks, and a partridge in a pear tree a flower bed--all in the same space. She's also created a sitting area from which to admire her killer goose and lame ducks beautiful garden and water view simultaneously. Not those upside down bushel baskets that date back to the Great Depression the 1970s daffodil business, but an actual sitting area with outdoor furniture. To create just the right ambiance, she's placed Killer Goose Gustav's feeding pan right near the otherwise charming sitting area strung up white Christmas lights to take your mind off Killer Goose Gustav the buzzard-size mosquitoes trying to carry you away. This amazing garden is already producing, and we're eating fresh vegetables almost every night. Another side benefit for her is she's lost a good deal of weight, what with all the weeding, hauling dirt, stooping, bending, chasing a killer goose, mulching, harvesting, weeding, watering and weeding some more. Perhaps best of all, Chesapeake Bay Daughter has her own garden that my mother is helping her with. Aside from having to water and tend to the garden every day, CB Daughter is learning invaluable tips from CB Mother, such as how to avoid being nipped by Gustav how to properly plant okra seeds and transplant tomatoes. Monday was the first official day of summer, according to the calendar. If my mother's garden is any indication of what the rest of the summer holds, I say bring it on. Above is a shot from a dock down Redart (which is trader backwards), and below is the view from the Eastern Shore campground we visited Memorial Day weekend. Lots of blue skies, dock poles and water; similar elements, distinct photos. I'm starting to really like this pairing of different, yet similar, pictures, even if it bores everyone else to tears isn't too terribly exciting. The postings this week will be worse than usual sparser than usual due to everything that's going on. There really is a lot to communicate - not the least of which is information about Blog Fest 2010, the success of my War on Ants thanks to a multi-faceted approach suggested by Terro, and a very special announcement about a major upcoming project that will absolutely ensure that CBW will have not one spare second of time to devote to blogging, which presents a quandary because she likes blogging. If you know where she can clone herself, please let her know. If you know why she flits between first person and third person, please let me know. For now, just enjoy the photos and send somebody to cut my grass since I no longer have time to do that either have a great week. p.s. Many, many thanks to all of you who have sent thoughts and prayers this way. I've relayed each and every word. It's been a difficult time for so many here in the county this past week, and your words of encouragement provide strength in a time of sorrow. Thank you so much. My dear friend Bayman, pictured above, has suffered a loss, as has the county of Mathews and a very large network of friends and family. Judy Ward will be missed by so many people. A week or so ago, we went swimming at Cow Point just as the sun was going down. The Chesapeake Bay Children love Cow Point, which is at the mouth of our creek. It was a favorite stomping ground of mine as a child. Click here to read a previous story about Cow Point, but otherwise enjoy these photos of the sunset, which was way more beautiful in person. Happy Sunday and Happy Fathers Day. A very, very small part of my yesterday--easily one of the most eventful days in recent memory--was spent driving by this gorgeous display of flowers, which is right across from Mathews High School. The internet tells me this is a trumpet creeper or a cow itch (yes, cow itch, and there are cows very close by although I didn't see them scratching). It's a very pretty weed. Yesterday was jam packed with so many good things and several very funny things, but all of that is overshadowed by a few very sad things happening to close friends of mine. In deference to these families I will share my stories with you at a more appropriate time. Instead I'll merely say hang on to the ones you love, tell them you love them, and cherish every moment of good health and of life. Every second of life is a gift and we cannot take any of it for granted. Go out and make the most of this beautiful Saturday, hug the ones you love, and be sure to stop and admire the beauty of what is around you, including the so-called weeds. These photos were taken from my car near Moon. Not near the moon, but near Moon. Downtown Moon consists of an old--very photogenic--post office (no longer used as a post office); a cemetery; some winding roads and trees. That description pretty much applies to most of inland Mathews County. For possibly the first time ever, today's photos actually have some relationship to the post. It's a novel concept, one which very rarely occurs to me. "The law relating to automobiles takes up a whole chapter of the State Code and is of course too lengthy to be printed here. However, here are some of the things it provides which are pertinent. A speed of not more than 10 miles an hour is prescribed when rounding curves, at the intersection of cross roads, in any village, or on any road where there is a collection of horses or persons. In passing a vehicle a machine should go to the left and not over 10 miles an hour in passing. When none of the above conditions exists, a speed of 20 miles an hour is permissible. Drivers of machines are also required to slow up when meeting vehicles and to stop when signaled to do so." Not that long ago, back when Jamestown was founded I was a kid, there were several major intersections that did not require a stop. There were also intersections where stopping was optional even though a stop sign stood proudly. When there's nothing coming for 15 days minutes, there really is no need. All this is leading up to a point, which is bound to make itself apparent here soon. Mathews County has no stop lights other than the obvious red light when the Gwynns Island bridge is open. Ninety years ago, there was no requirement to stop at intersections and crossroads; you could take them at 10 miles per hour. Now, there are stop signs and for the most part people are asked to have to stop. What will these intersections be like 90 years from now? Will there be stoplights? Although we could seriously use one at the Route 3/198/Get-n-Zip intersection. My two one local reader: If you could put up a stoplight in the county, where would you put it? Or do you not want one anywhere (which is fine)? My other three two readers: Do you know a place with no stop lights? Welcome to Thursday, also known here as Three Thing Thursday, where we share three random thoughts. 1. The photo above, which I definitely may have posted before, dates back to June of 2009. A sailboat was moored just off Gwynns Island and I was admiring the view from the beach. The more I stare at this, though, the more I feel there should be water spilling out of the lower left corner. It's more than slightly off kilter, much like the photographer. 2. This week, because I had nothing better to do, I took a completely different route home from Williamsburg where I work. There are only two possible ways - across the York River at Yorktown and down 17 or through West Point and over the Mattaponi and Pamunkey Rivers. The typical York River/Rte. 17 way is shorter mileage-wise, but here lately due to mutant drivers construction and mutant drivers, it's been taking about 15 minutes longer than usual. By taking this alternate route through West Point I arrived home 5-10 minutes earlier even though it's about 10 miles longer distance-wise. However, due to being a mutant driver a creature of habit, I probably will stick with the shorter, more tedious route. Don't ask me why. No doubt it's the same reason I stuck with dial-up internet as long as I did. To get to the bottom of these mysteries would require a trained psychological professional some deep introspection. 3a. Does anyone want some CATS white raspberries? I have a cluster of bushes which, after being all docile and polite for 4+ years, have suddenly taken over my back patio off like wildfire. I can't pick them fast enough, and they're absolutely delectable. 3b Warning: Picking white raspberries can be harmful to your psyche health because ants, wasps, chiggers, ants and ants also love white raspberries. When you've lived for nigh on 10 years in the same house as insects, reaching a hand blindly into a thorny raspberry bush teeming with creepy crawlies will make you scream and seek a trained professional can be challenging. 3c. Speaking of ants and aren't I always the folks at Terro have finally sent me the silver bullet--at least it's working for the time being. Details will be forthcoming. Now it's you're turn to share three (or more) things. Whatever you want, anything at all. Above is a No Trespassing sign in the swamp at Bethel Beach. Below is a No Trespassing sign in the swamp at Bethel Beach. OK, not quite, but almost. Here lately, I've been noticing pairs of photos that contain similar elements yet retain their individuality. Is it possible for inanimate objects to retain individuality or is that only a concern for twins and triplets? There is humor--and even beauty--to be found in No Trespassing signs in the swamp at Bethel Beach, and that humor involves knee-deep creek mud, killer/mutant fiddler crabs, snakes, horse flies, mosquitoes and dead bodies who knows what else. In short, the very last place a person would be caught trespassing is in the swamp at Bethel Beach. If you are bored and/or are feeling creative, list some reasons--besides hunting illegally or hiding a body--that anyone would want to trespass in a swamp. CBW: Hey, Gustav. I never spent much time on Facebook back in the Dark Ages when I had dial-up internet, but now that Jim from Hallieford has hooked me up and dragged me into the current century, I've been visiting more frequently. Imagine my surprise when I logged on last night and saw you conversing with people--people I know! Gustav, beginning to swell with pride: Oh, well then, that's different. Let me slow down for a chat. Yes, of course I have a Facebook account, I even have a fan club. I have friends--and lots of them. Many of them are coming to Blog Fest 2010, which is exactly a month from today, and last time I checked there's no law saying I can't be friends with your friends. CBW: Blog Fest is exactly one month from today? One month? Just the other day it was four months away. One month? Gustav: Girlfriend, I don't stutter. Hiss, yes. Stutter, no. CBW, frantically pushing the internal emotion button labeled Avoidance and Denial for Survival, because she has done nothing to prepare for Blog Fest other than think about it: OK, well, never mind about Blog Fest and Facebook. Do you think it's at all possible for you to smile for the camera? Would it kill you? Gustav: It might. Anyway, I am smiling! It's your tough toenails if you can't see it. But if you insist, I'll try harder. How's this? p.s. Big Hair Envy and I do intend to talk about focus on Blog Fest over the next week(-ish), so thanks for your patience. p.s.s.t. Does anyone want a winged demon goose on the noose loose? only a few lots back from some wonderful views of the Chesapeake Bay, which is just beyond these trees. This is the view as you drive in. Your blood pressure will drop at least ten points as soon as you arrive. Once upon a time, there was an adorable, affordable vacation retreat for sale. Those seeking to escape the worries and hurries of modern-day life should contemplate this retreat, which couldn't be farther from WalMart Vietnamese fresh spring rolls a gas station the stresses of modern day life. No, CBW is not a real estate agent. Yes, she is motivated to help sell it. Yes, she would help sell it even without the motivation, because she photographed it for other reasons a while back and fell in love with it. No, the fiddler crabs are not hovering in the roadways yet, though they are on the sidelines. Yes, it's true you can hear yourself think this far off the grid. Yes, it's true you can hear your neighbor think this far off the grid. No, we're really not off the grid, it only feels that way most days. Yes, the owner has offered her place to Blog Fest guests if it has not sold by July. Yes, it's an incredibly generous offer. Yes, I'd buy it if I had the spare money. No, there is hardly a square inch of grass to cut. Yes, that's almost exactly why I'd prefer to live there. Yes, this post is over now. Contact me at ChesapeakeBayWoman@gmail.com if you have any questions or are interested in this adorable, affordable retreat. This was a recent sunrise on Queens Creek. They're really incredible this time of year - sunsets too. Another thing that's incredible is the length of this post. Pueblo Girl has tagged me for a meme. Three years ago, that sentence would have made no sense to me, and to this day I'm not sure I can explain what a meme is, but loosely translated, blogger Pueblo Girl has asked me to answer ten questions. Then I ask some questions and tag others. Let's begin. 1. What music/tribe defined you as a teenager? While most of my friends were into rock, my favorite was funk and disco. Tribe? Well, the Pamunky and Mattaponi Indians were nearby, but there was never any interaction with them. The family clan influenced me, obviously, but the people I chose to hang out with were often the underdogs, the athletes (of the same underdog vintage), or the seriously funny (ha ha) people. As long as I have access to the internet, rural. Even without it, rural, although I might fuss a bit and stomp my foot--but only once. 3. How old do you feel inside? And how different is this to your real age? Most days I feel about 18 inside. On the long days when I have to commute to work while simultaneously tending to my family's needs, I feel like I'm 88 trying to climb Mt. Everest blindfolded. 18 is about 27 years from my real age, and now I must go cry. 4. Worst relative story, please. After I stop crying about my age, I'll share a story from Dysfunction Junction, which by the way could be the name of a whole new blog filled with stories that you wouldn't believe. But to answer the question, my uncle, who lived next door to us, suffered from schizophrenia (really). Growing up with a close family member who struggled with mental illness was unusually difficult to say the least, and I've been meaning to write about all that happened. That story alone would fill a book and make a great movie--a sad, tragic, bittersweet movie much like A Beautiful Mind. Or, it might be when we were vacationing in the Outer Banks and my mother showed up to the supper table wearing nothing but her bra. We had a guest there. At the table. Bra. At the table. Guest. Excuse me while I resume my crying spell. 5. What are you reading at the moment? Aside from the instructions on the various boxes of ant killer sent to me by the wonderful folks at Terro, I'm trying to decipher a contract that was due to be signed last week. If anyone speaks the ancient language of Contracts, please let me know. When I can focus, which is never rarely, I am plodding through Gabriel Garcia Marquez's Love in the Time of Cholera, sent to me by one of my best college amigos, Sam H.
6. Who/what pushed /inspired you to start blogging? I knew no more about blogging than your average ground hog, but one day back in 2007 I was searching for "the world's best chocolate cake" for my daughter's birthday and stumbled upon the Pioneer Woman's site. I became hooked. Through her comment section I got to know a wonderful woman named tj, who convinced me to start my own blog. Another friend Kathy taught me how to upload photos, and the rest is a mystery history. 7. Are you a learner or a teacher? Yes. However if we're talking about technology, then neither applies. 8. What is your pet hate? Assuming this is different from a pet peeve, I'd say litter boxes, hairballs, tumbleweeds of fur, fleas, ticks and spending way too much money on cat food. Pet peeves are many but rarely debilitating because in the scheme of Life they are just ants invasive insects that one must accept and endure. 9. Your word is law. What is your first decree? I hereby declare that every citizen of this planet shall be helpful, tolerant, accepting and appreciative of other people and their differences; that we all take responsibility for conserving and preserving the planet's natural beauty and resources and not try to pave it over one strip mall at a time; and that CBW never has to work in a 9 to 5 office environment again but still can make ends meet doing things she loves, such as taking pictures and writing silly little blog posts. The End. 10. Swanky bars or sawdust on the floor affairs? Although I can navigate both, I much prefer the sawdust on the floor affairs, because they remind me of my kitchen floor home. Given that I'm preaching about tolerance, however, I'll happily take whatever is thrown my way and adjust accordingly. Now I'm supposed to ask questions and tag people, but I'm going to bend the rules a little. Instead of 10 questions, I'll ask 5; and instead of tagging specific bloggers, I'll tag you, my three two readers. If you feel like answering, leave a comment. 1. If you could change one thing about your life at the moment, what would that be? 2. Of all the places you've traveled to, what destination was your favorite and why? 3. Do you exercise? How often and what do you do? 5. What is your favorite meal and who prepares it? 6. Pueblo Girl's questions are incredibly clever and she has a gift with words, my personal favorite in this series of questions being "sawdust on the floor affairs." Thank you, Pueblo Girl, for the meme, and thank you to anyone who has waded this far through this post. You both deserve a medal. This is Jim from Hallieford, who saved me from myself and dial-up internet. When even Mother Nature could not believe that I was using dial-up internet, she orchestrated a thunderstorm and directed a lightning bolt to take out any hope of continuing on in blind obsolescence. Mother Nature was as tired as everyone else of hearing Chesapeake Bay Woman complain about her computer, her internet connection, and the fact that it took 15-20 minutes to upload one photo. Mother Nature also knew that Chesapeake Bay Woman was afraid of change and needed a cattle prod gentle nudge to move in the right direction, which was basically towards the current century. - Although cable is available in Mathews on my very lane, my house is located just far enough from the road that the cable folks would not run a line to it. So although my neighbors across the street can receive cable TV and internet (if they wanted), that's not an option for me. - Verizon sounded like a nice alternative until I learned that people right across the field from us could not receive a steady signal although their cell phones worked just fine. I called the local Verizon folks up and the lady confirmed that if we had trouble with the cell phone signal, the internet probably would be spotty as well. Given that I have to climb a telephone pole go outside to receive a cell phone call, I figured Verizon was not for me just yet. -Satellite internet was an option, but I was afraid of the initial expense to set it all up, which is significant. So after pondering these options--all of which require either a contract, an arm and a leg, a maximum usage cap, and/or a first-born child, I did what any intelligent consumer would do: I asked my 15-year-old son to do some research. What he came up with was this: "Mom, I don't know about all this because of the contracts, our location, the usage caps, the equipment fees and that whole first-born child thing which hits close to home. If worse comes to worst, let's do satellite." In the meantime, Jim from Hallieford contacted me and said very confidently that he could fix the whole internet problem. Jim from Hallieford: Hi. I can have you up and running in no time flat. CBW: I don't know.. but sure, come on over and test things out. Jim: The signal is strong. You're good to go. CBW: I don't know....so what about the contracts, the usage cap, the equipment fees and the first-born child thing? Jim: No contract. Minimal charge. Personalized service. You can keep your first-born. It's all good. There. You're up and running. CBW: Can't talk because she's fainted. CBW's Son: Can't talk because he's flabbergasted. Jim: Here, until your router arrives, use mine. It's all good. At this juncture, a choir of angels sang Alleluia, and the Chesapeake Bay Family officially stepped into the current century. Thank you, Jim from Hallieford, for saving my life the day. p.s. Whereas I used to spend my weekends pre-loading photos because each one took 20 minutes, I can now load photos in the blink of an eye. Plus, I get to keep my first-born child. It's absolutely amazing. After forty days and forty nights four days of an internet-less house, which translates into several hundred unread e-mails, a couple of days of blog detox, and a new found interest in sleeping watching TV, I am back on-line again thanks to Jim from Hallieford. Details on the transformation from stone tablets and hieroglyphics dial-up internet to broadband will appear in this weekend's post. Right now, as always, there are a thousand things that need tending to, none of which involves the internet, and at least one of which involves ants. Hopefully tonight I can focus on reacquainting myself with the blogosphere. In the unlikely event I do not post tomorrow, it's because I've forgotten how to write due to a minor technological glitch known as Chesapeake Bay Woman does not do well with change, even when it's for the better. Plus there really was a minor technical glitch this morning, but Jim from Hallieford took care of it right away. Due to the CBW luck, which is not good, she's nervous that it could happen again. Or she's just nervous with the change. Take your pick. Tune in tomorrow for photos of Jim, the miracle worker High-Speed Internet Man. Well, it finally happened. A severe thunderstorm evidently fried the modem on my computer. Dial-up internet is not working. Until I either fix the modem, throw the computer in the creek, or find another internet source, I won't be posting or even able to check e-mail unless it's at the library. Now pardon me while I have a conniption. This is a sister to Thursday's photo. The swiftness with which the sky changes at sunset (and sunrise for that matter) never ceases to amaze me. I have much to talk about and no time to write at the moment. Some of the things planned for upcoming posts include Blog Fest 2010 (July 15-18); a quaint little waterfront trailer for sale; the tale of a wonderful gathering of high school friends; and an update on our neighborhood gathering yesterday that may or may not have included Elvis parachuting in. There is never--ever--a dull moment in Mathews. Once again we have a photo that is completely unrelated to what I'll be talking about today, which is a new Mathews bar and grill called Cheerleaders. Cheerleaders is in the old Club 14, which back in the day was quite the scene. Bar and dance hall, the place had a lighted disco floor. This I know because one summer during college my cousin Julie and I ventured inside, which is a story for another time. Let's just say that Club 14 had its own distinct personality, and that personality included drinking, more drinking, disco dancing, followed by drinking. Toss in a stabbing, a shooting, then more dancing and drinking--not necessarily in that order, and you've got yourself a Club 14. The thought of going to Club 14 for a meal is a rather interesting concept. - The restaurant will serve Mexican and American dishes. - There is a full-service bar. - It is designed to be a "family place." - Quieter music is planned for earlier in the day; live entertainment starting later in the evening. - Sports bar has 20 flat-screen TVs; pool table; dance floor* and stage. * I wonder if the dance floor still lights up a la John Travolta in Saturday Night Fever or if they've put a new one in. ** Does this mean there will also be male cheerleaders serving? Perhaps I'll have to stop by and find out. Did anyone local ever go to Club 14? Anyone remember Pierre the DJ? I think his weekend name was Beast from the East. For anyone else - How about a lighted disco dance floor almost exactly like the one in Saturday Night Fever. Am I the only one who thought it was thrilling? Keep in mind there wasn't a lot to do around here growing up, so if the answer is, "CBW, you really need to get out more often, a lighted dance floor is nothing to get excited over," I totally agree. Still, I loved that dance floor and think about it fondly every time I drive by. At Aaron's Beach a week or so ago, I noticed several of these birds hanging out in the marsh. Now, as you may know, Chesapeake Bay Woman is not good with details, specifics, facts, data, fine print, technicalities, anything requiring patience and housework. In spite of all that, she is going to take a stab at assigning a label for this bird, and what she's come up with is a rail. Before both any of you rush to correct me, let me also say that even if this is not a rail, we do have rails in Mathews. And today we're talking about them. Naturally when required to provide facts and details, I turn to the internet, because as we all know everything one reads on the internet is whatever you want it to be, just keep looking until you find the answer you like accurate and factual. "...any of 127 species of slender, somewhat chicken-shaped marsh birds, with short rounded wings, short tail, large feet, and long toes, of the family Rallidae (order Gruiformes). The name is sometimes used to include coots and gallinules, which belong to the same family, but coots and gallinules are far more ostentatious. Coots and gallinules flock like ducks, swim in open water, and waddle conspicuously on shore. By contrast, rails are secretive birds, hiding among reeds at the water’s edge by day and uttering their calls mostly at night." Oh, the field day I could have with these words, but before I say something my children might read I might regret, let's bring this brief discussion about rails, coots and gallinules to a close. If you hear somebody cackling and howling, it's just me laughing at my own off-color remarks about coots and gallinules and rails. Oh my. This relaxing scene is from last weekend's camping trip over on the other side of the Chesapeake Bay. I contemplated wading out to that little boat and taking it for a spin, but only for a second. Today is Thursday, which means it's Three Thing Thursday, where I share three things and you share three things. 1. When did June arrive? Have we skipped some years months? Wasn't it just Christmas? Easter? 2. In any case, if it's June that means it's time for me to focus on Blog Fest 2010, July 15-18, when bloggers from all over the map will descend on little old Mathews County. Over the weekend I'll try to concoct a Blog Fest-related post, but the bottom line is--if you're interested in coming, just e-mail me at ChesapeakeBayWoman@gmail.com so I can get your information and keep you up to date on what is happening and the schedule of events, which of course we haven't figured out yet. 3. I am thrilled to announce that the very kind people at Terro, who make all sorts of ant annihilating products, have offered to send me some free samples of various ant-killing products since my liquid bait traps no longer seem to be enough to stop the influx. Oh, how eagerly I await this package. Hopefully it will arrive before the ants stage their coup, which they're slowly building up to every hour of every day that passes. Now it's your turn to share three things, whatever you want; anything at all. As long as it's not covered in ants. This cute red shack lives at the intersection of some major roads leading to the county beaches. Or maybe this is a major intersection of some cute red roads leading to the county beaches. How about a cute red intersection leading to a major county beach and on the way there's a shack? Either way, no matter how you slice and dice it, today Chesapeake Bay Woman is so worn out and spread so thin that she can't correctly situate her adjectives or construct a proper sentence can't see straight and wonders why she refers to herself in the third person, as if to distance herself from herself. After reflecting upon that opening paragraph, she understands and no longer wonders about the need for distance. This week Chesapeake Bay Son graduates from 8th grade, and aside from the fact that I never knew one graduated from 8th grade, this entails an awards ceremony today; an 8th grade dinner tomorrow night, and a graduation ceremony on Friday morning followed by lunch and then a pool party down Ware Neck. Then he takes off for a week at the beach with a friend. I went from 8th grade to 9th grade without anyone's acknowledgement any ado; graduated from high school with a class party down Port Haywood where I slept in the back of a Volkswagen Vanagon with six other people; then graduated from a major university. I don't remember pool parties or ceremonies or free beach vacations being involved. Yet I'm very proud of him and will try not to make comparisons happily cheer him on at each event. Do you remember any major graduation festivities other than college or high school? What is your most vivid memory of any graduation event? Above is a shot of the Chesapeake Bay from Aaron's Beach in Mathews County. On the other side of the bay on the Eastern Shore, the Chesapeake Bay Family camped this past weekend. There's been no time to download and upload and load and unpack and pack and all that stuff, so I don't have photos yet (or a functioning lower back). I do have a mathematical equation to kick off the week. See if you can solve this addition and subtraction problem. No trips to the E.R.! When added up, this represents a priceless weekend with my two favorite kids--and an ardent desire for a shower which doesn't require flip flops. Bonus Question: What are the odds that with 18,692 campers spread out over 600 or so acres I'd be a mere two campsites down from three people I work with? Anyone? The math portion of this post is now over.